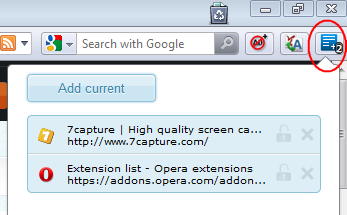 Opera has come a long way with a lot a new feature additions.In the latest version Opera Extensions.Firefox and Google Chrome have a lot of extensions which make it very easy for users to incorporate features of their choice into the browser based on their requirements.Opera Extensions now makes it easy to extend the browsers default features using the extensions.To install Extensions in Opera, head to Opera Addons and browse through the extensions category wise based on your need.To-Read Sites is a productivity extension of the Opera Browser which let users save the temporary list of sites you want to visit later.Install the extension and it adds itself beside the address bar. Click on the To-Read Icon and click the “Add Current” button to add the website to the list. To delete a previously saved link from the list, Click the “Delete” button.If you want to keep the link in the list without deleting from the list even after clicking it once. 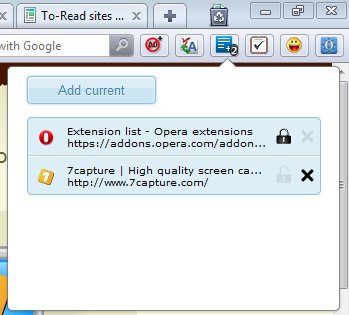 If you are using a Firefox user, you can try Read It Later, which supports wide range of platforms.